The Gallia Farm Bureau $2,500 Reward Program pays off. 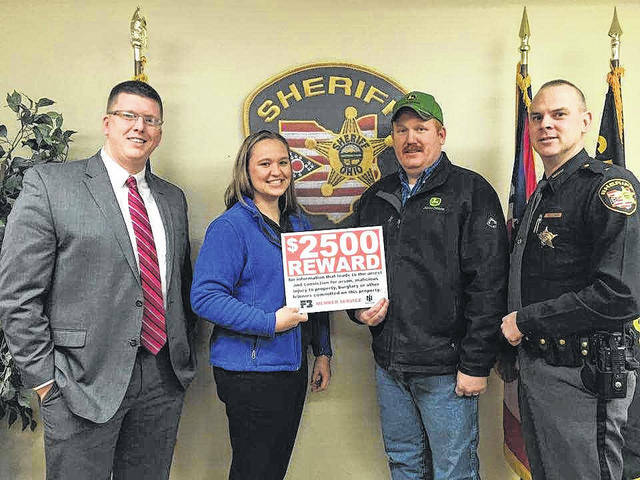 This Farm Bureau member benefit provided a $2,500 reward to a person in Gallia County who assisted with the conviction of a felony after a theft at Bridgeport Equipment in Gallipolis. Pictured from left are Gallia County Prosecutor Jason Holdren, Organization Director Farm Bureau Ashley Kasler, Store Manager at Bridgeport Equipment in Gallipolis David Sherman, and Gallia County Sheriff Matt Champlin.